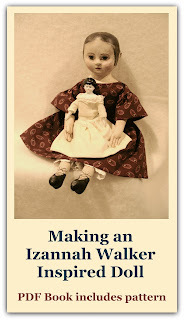 Today I was able to take a mini-vacation and drive down to Lucy's Doll House in Camden to document the latest Izannah Walker doll in residence there. It is because of Sue and the generosity of Lucy's Doll House that I've been able to document these dolls. Sue Singer was in the shop today while I documented the two dolls below and we had great conversation while I took pictures. A note about the pictures - All photos/pictures presented in this post are copyright Dixie Redmond 2009 and all rights are reserved. An artist or student may copy for personal use for study but the images themselves may not be used in derivative works of art or shown/reprinted in any publication without permission. The doll on the left is a cloth doll with an applied bonnet. All cloth! I was fascinated by it and took well over 200 pictures of both these dolls. 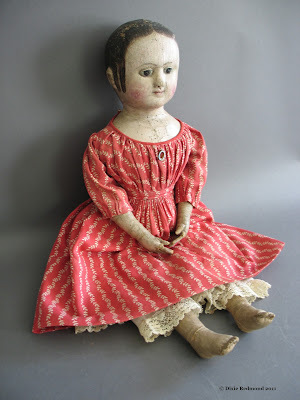 Detailed pictures of the folk art doll on the left are on my Northdixie Designs blog. The Izannah doll is divine - so wonderful and petite. It's hard to tell the scale of things, but my thumbnail is about as large as the palm of this little 15 1/2 inch doll's hand. She's so wonderful! Dixie This little face is my most fav Izzy doll!!!!!!!!!!! So tiny and precious!